1. "When he came and saw the grace of God, [Barnabas] was glad; and he exhorted them all to remain faithful to the Lord with steadfast purpose" (Acts 11:23-24). Such was the joy and amazement of the Apostle in Antioch, where he had been sent by the Church in Jerusalem. Today I share his joy and make my own his exhortation. This visit to Syria takes me back to the dawn of the Church, to the time of the Apostles and the first Christian communities. It concludes my pilgrimage in the Biblical lands which I began in the year 2000. It also provides the happy occasion to meet with you in Syria and to return the visits which you have made to the Church of Rome and to its Bishop. In this Cathedral of the Dormition of the Virgin Mary, I greet most especially Patriarch Ignatius IV Hazim. Your Beatitude, I thank you whole-heartedly for your fraternal welcome today and for this Liturgy of the Word which it is our joy to celebrate together. Your Beatitude’s interest and active involvement in the cause of Christian unity is known to all. It is something which I deeply appreciate and for which I thank God. Beloved Brother, I invoke the Lord’s blessing upon your ministry and upon the Church of which you are the Pastor. 2. Built upon the foundation of the Apostles Peter and Paul, the Church in Syria was quick to show an extraordinary flourishing of the Christian life. With good reason, the Council of Nicea recognized the primacy of Antioch over the metropolitan Churches of the region. As we think particularly of Ignatius of Antioch, John Damascene and Simeon Stylites, how can we fail to recall as well the many confessors and martyrs of this region who adorned the beginnings of the Church by their fidelity to God’s grace, even to the point of shedding their blood! How many monks and nuns withdrew into solitude, filling the deserts and mountains of Syria with hermitages and monasteries, in order to live lives of prayer and sacrifice, praising God so that in this way they might, in the words of Theodore of Edessa, "attain to the state of beauty" (Discourse on Contemplation). How many Syrian theologians helped to establish the theological schools of Antioch and Edessa! How many missionaries left Syria to go to the East, following the great missionary movement to Mesopotamia and further still to Kerala in India. Is not the Church of the West greatly indebted to the many pastors of Syrian origin who assumed the ministry of Bishop there, even the ministry of the Bishop of Rome? May God be praised for the witness and the influence of the ancient Patriarchate of Antioch! Unfortunately, the unity of the illustrious Patriarchate of Antioch was lost through the centuries, and we must hope that the different Patriarchates existing now will once again find the path that will lead to full communion. 3. Between the Greek Orthodox Patriarchate and the Greek Catholic Patriarchate a process of ecumenical rapprochement has begun, and for this I thank the Lord with all my heart. It is prompted by the desire of the Christian people, by dialogue between theologians, and by fraternal cooperation between the Bishops and pastors of the two Patriarchates. I urge all those involved to pursue this quest for unity with courage and prudence, with respect but without confusion, drawing from the Divine Liturgy the sacramental strength and theological stimulus which are needed in the process. The quest for unity between the Greek Orthodox and the Greek Catholic Patriarchates of Antioch is clearly part of the wider process of reunion between the Catholic Church and the Orthodox Churches. That is why I reaffirm my sincere desire that the Mixed International Commission for Theological Dialogue between the Catholic Church and the Orthodox Churches may soon be able to continue its work in the most appropriate way. The more this dialogue touches upon central questions, the more demanding it will become. This is no cause for surprise, and still less an excuse for lethargy. Who can stop us from placing our hope in the Spirit of God who does not cease to kindle holiness among the disciples of Christ’s Church? I wish to thank most sincerely Patriarch Ignatius IV for the positive and effective contribution which the Patriarchate of Antioch and its representatives have constantly made to this process of theological dialogue. I am likewise grateful to Patriarch Gregory III and his predecessor Patriarch Maximos V for their unfailing contribution to the climate of fraternity and understanding, which is so necessary if the dialogue is to develop well. 4. In the same spirit of gratitude and hope, I would like to mention the deepening of fraternal relations between the Syrian Orthodox Patriarchate and the Syrian Catholic Patriarchate. I greet especially Patriarch Zakka I, in whom the Catholic Church has always found a faithful promoter of Christian unity, ever since the Second Vatican Council which he attended as an observer. Your Holiness, since your visit to Rome in 1984 it has been our joy to be able to make real progress on the road to unity, having confessed together Jesus Christ as our Lord, true God and true man. On the same occasion, we were able to authorize a plan of pastoral cooperation, notably at the level of sacramental life, in cases where the faithful have no access to a priest of their own Church. With the Syro-Malankar Church in India, which looks to your Patriarchal authority, the Catholic Church has equally good relations. I beg the Lord that the day will soon come when there will be an end to the final obstacles to full communion between the Catholic Church and the Syrian Orthodox Church. 5. In the course of time, and especially at the start of the twentieth century, Armenian, Chaldean and Assyrian communities, forced by violence to leave their homelands, came to the Christian quarters of Damascus, Aleppo, Homs and other parts of this region. In Syria they found refuge, a place of security and peace. I give thanks to the Lord God for the hospitality offered by the Syrian people on a number of occasions to Christians of the region suffering persecution. Transcending all ecclesial divisions, such hospitality became the pledge of an ecumenical rapprochement. In the person of the persecuted brother the Christ of Good Friday was recognized and welcomed. Since then, by conviction and by necessity, the Christians of Syria have learnt the art of sharing hospitality and friendship. Ecumenical contact at the level of families, children, young people and the leaders of society holds the promise of the future of evangelization in this country. It will be up to you, Bishops and pastors, to accompany this happy process of rapprochement and communication with wisdom and courage. The cooperation of all Christians, whether at the level of social and cultural life, in promoting peace, or in the education of the young, is a clear indication of the degree of communion already existing between them (cf. Ut Unum Sint, 75). By virtue of the apostolic succession, the priesthood and the Eucharist unite in very close bonds our particular Churches who call each other, and love to call each other, Sister Churches (cf. Unitatis Redintegratio, 14). "For centuries, we lived this life of ‘Sister Churches’, and together held Ecumenical Councils which guarded the deposit of faith against all corruption. And now, after a long period of division and mutual misunderstanding, the Lord is enabling us to discover ourselves as ‘Sister Churches’ once more, in spite of the obstacles which were once raised between us. If today, on the threshold of the third millennium, we are seeking the re-establishment of full communion, it is for the accomplishment of this reality that we must work and it is to this reality that we must refer" (Ut Unum Sint, 57). 6. Just a few weeks ago, we had the great joy of being able to celebrate the Feast of Easter on the same day. For me, this happy coincidence in the year 2001 was a pressing invitation of Providence, addressed to all the Churches and Ecclesial Communities, to return without delay to a common celebration of the Paschal Feast, the Feasts of all feasts, the central mystery of our faith. Our people rightly insist that the celebration of Easter should no longer be a cause of division. Since the Second Vatican Council, the Catholic Church has shown herself favourable to every effort to re-establish the common celebration of the Paschal Feast. Yet this process seems more difficult than anticipated. Is it perhaps necessary to envisage intermediate or gradual stages, in order to prepare minds and hearts for the implementation of an arrangement acceptable to all Christians of East and West? It falls to the Patriarchs and Bishops of the Middle East to assume together this responsibility with regard to their communities in the various countries of the region. From the Middle East there could be born and go forth a new energy and inspiration on this point. 7. A few weeks from now, we shall celebrate together the Feast of Pentecost. Let us pray that the Holy Spirit "will stir all the disciples of Christ to desire and to work for the peaceful union of all in one flock under one Shepherd, in the way decreed by Christ" (Lumen Gentium, 15). Let us implore the Spirit to make us grow in holiness, for there is no lasting unity which is not based upon humility, conversion and pardon, and therefore upon sacrifice. When the Spirit came upon the Apostles at Pentecost, the Virgin Mary was there in their midst. May her example and her protection help us to listen together to what the Spirit is saying to the Churches, even today, and to welcome his words with confidence and joy! 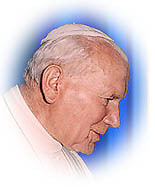 VATICAN, Jan. 25, 01 (CWNews.com) -- During an ecumenical service in Rome on Thursday, Pope John Paul II proposed a concrete step toward Christian unity: an effort to agree on a single date for the celebration of Easter. At a Liturgy of the Word ceremony at the basilica of St. Paul outside the Wall, the Holy Father suggested the common Easter celebration as a realistic step toward Church unity. The current year is a rare one, in which the different liturgical calendars used by Christian denominations all agree in marking April 15 as Easter Sunday. "This should encourage us to find a consensus on a common date for this feast," the Pope suggested, provoking hearty applause. At St. Paul's basilica, the Pontiff was joined by 23 other Christian leaders, representing Orthodox and Protestant groups, in a ceremony closing the annual Week of Prayer for Christian Unity. In his remarks, the Pope noted that there is "no ecclesial pride in the Catholic Church." He said that the Catholic Church is totally committed to ecumenical progress. "Despite the misunderstandings and the many problems that still prevent us from enjoying full unity, we can also see-- at the visible frontiers of the Catholic Church-- important elements of sanctification and of truth that the one Church of Christ is moving us toward true union," the Pope said. Church leaders should not see it as their goal to "diminish the differences" that separate one body from another, the Pope continued. Theological disagreements, he explained, should be seen not as "obstacles to dialogue" but rather as "an invitation to a frank and charitable exchange" that would ultimately serve the cause of truth. "Real ecumenical work is not looking for compromise, and does not make concessions that involve the truth," he said. Renewing the call that he made at the start of the Jubilee year, the Holy Father called for a "purification of memory" among all Christian believers. "During the course of the second millennium, we opposed each other, we were divided, we issued mutual condemnations," he observed. Now, he challenged Christians to "forget the shadows and scars of the past," and turn together to the task of restoring unity. "Purification of memory also means building a spirituality of communion," the Pope said. "We must live concretely the communion which-- even if it is not full-- already exists among us." The exchanges between representatives of different Christian groups, he argued, should be marked by "signs of love" and a real willingness to establish "reconciliation and peace among all Christians." The ceremony at St. Paul's allowed representatives of different religious bodies to read from the Epistles of St. Paul, in Greek, Syrian, and Russian. After the ceremony, the Pope ate lunch with the other Christian leaders, at the Benedictine Abbey that administers the basilica. Pope John Paul II also personally announced his plans to visit Syria. The Pope's surprise announcement came at the ecumenical celebration of the Week of Prayer for Christian Unity, held at the basilica of St. Paul outside the Wall in Rome. "I am eagerly awaiting the trips that will take me to Syria and to Ukraine," the Pope said. "My hope is that they will contribute to reconciliation and peace among Christians." Although the dates of the Pope's trip to Ukraine have already been announced-- June 23- 27-- there has been no official announcement of the trip to Syria, and the Vatican has not released dates for that visit. Father Roberto Tucci, the Jesuit priest who usually handles advance work for papal trips (and who will become a cardinal in February) is currently in Damascus discussing details of the plans for that voyage. Vatican insiders expect the Pope to travel Syria sometime in the spring. There is also some speculation that he might stop on the island of Malta on his return trip to Rome. Also, President Constantinos Stephanopoulos of Greece has issued an informal invitation for Pope John Paul II to visit that country. During a private meeting with the Pontiff on Wednesday, the Greek president broached the possibility of a papal visit. Vatican spokesmen indicated that they are awaiting a formal invitation. Pope John Paul reportedly thanked Stephanopoulos for his suggestion. He has in the past expressed his hope to visit Greece, continuing in his personal pilgrimage, following the footsteps of St. Paul. However, difficulties in relations with the Greek Orthodox Church have deterred the Vatican from pursuing the idea energetically. In 2001 unlike most years, Christians of East and West celebrate Easter on the same date. Sadly, this is an exception, reminding us that Christians are divided on many issues, even on the date for celebrating this central Christian mystery. Christians have struggled from early times with the question of establishing a common date for celebrating Easter. The issue was addressed again in the twentieth century, and especially during the last three decades. Christian hopes for a common date are motivated primarily by theological concerns. A common date, said a World Council of Churches (WCC) consultation in 1970, "would ... remove an obstacle which obscures the unity of Christians and it would provide a new framework for common witness to the Risen Lord" (The Ecumenical Review, April, 1971, 177). Particularly since the Second Vatican Council the Catholic Church has expressed deep interest in establishing a common date for Easter. The Council encouraged seeking a fixed date if there was ecumenical agreement to do so (cf. Appendix to Constitution on the Sacred Liturgy, 1963). Until that could be achieved, the Decree on Eastern Catholic Churches, as an interim approach, authorized Patriarchs or authorities of a given place to seek unanimous agreement, after ascertaining the views of all concerned, on a single Sunday for observing Easter. After Vatican II, this hope was raised in correspondence between Pope Paul VI and the Ecumenical Patriarchate, and in the Joint Working Group between the Catholic Church and the WCC. The Pope's letter to the Ecumenical Patriarch Dimitrios I (March 26, 1975) indicates the evangelical purpose of seeking a common date: The world in which we live has perhaps a greater need than ever that we should testify ... to our faith in the Resurrection of Jesus Christ, Our Lord. Moreover, his Resurrection is the foundation of our faith - this faith that is called in question by many. Did not St Paul write that if Christ be not risen our faith is vain (1 Cor 15:14)? Moved by this conviction, and trusting in the power of the Risen Christ and his Spirit, we express our hope that by celebrating the mystery of mysteries with a single heart and voice, we may be able to render glory to God, the Father of Our Lord Jesus Christ, who raised Him from the dead (Rom 16:6; Col 2:12). A specific proposal was made in an ecumenically sensitive way in 1975 by the Catholic Church in coordination with the WCC. On behalf of the Pope Paul VI, Cardinal Willebrands, president of the Secretariat (since 1988 Pontifical Council) for Promoting Christian Unity, proposed in a letter to Patriarch Dimitrios I (18 May 1975) and other Orthodox leaders, with letters of similar contents sent to WCC general secretary Dr Philip Potter and to leaders of world confessional bodies, that from 1977 (a year in which all Christians would celebrate Easter on the same day) onwards, "Easter should always be celebrated on the Sunday following the second Saturday of April". As part of its preparation for its 1975 assembly in Nairobi, the WCC was also surveying its member churches on the same question. As a result of its survey the WCC concluded that "at this stage, a specific proposal would not lead to a date uniting all Christians in the celebration of Easter on the same day". It therefore became clear that it was not possible to go further on the proposal at this point. Since the Catholic Church did not want to take a decision that would create another obstacle to unity, its plan was not put into effect. Another proposal for seeking a common date for celebrating Easter has emerged as a result of a consultation co-sponsored by the World Council for Churches and the Middle East Council of Churches in Aleppo, Syria in 1997. The Aleppo plan proposes a common, though movable, date for Easter, different from the fixed date suggested in 1975. Edward Cardinal Cassidy, then president of the Pontifical Council for Promoting Christian Unity, expressed in 1997 his support for studying this proposal, and gave an initial affirmative reaction to it. Celebrating Easter on the same date in 2001, is a grace. It is the hope of the Catholic Church that Christians find a way to do this annually. May we, his disciples, use this opportunity of contemplating the Resurrection of the Redeemer together this year to beg his forgiveness and mercy for our separation, and to entreat his help in taking steps towards the unity for which he prayed (Cf. Jn 17:21). EASTER MASS 2004: Pope John Paul II holds the Host during Easter Mass celebrated in St. Peter's Square at the Vatican Sunday. The Pontiff called for world leaders to resolve conflicts in Iraq, the Middle East and Africa. VATICAN CITY (AP) -- Pope John Paul II celebrated Easter Mass on Sunday with calls for world leaders to resolve conflicts in Iraq, the Palestinian territories and Africa, as Christians around the world marked the holiest day on the church calendar. Easter marks the day, according to the Bible, that Jesus rose from the dead after being crucified. The joyous celebrations in Rome contrasted with the muted Easter festivities in Jerusalem, where a few hundred pilgrims and Palestinian Christians attended Mass at the Church of the Holy Sepulcher -- built over the skull-shaped rocky mount believed to be the place where Jesus was crucified. Attendance was also low at the Virgin Mary Catholic Church in Baghdad, where about 100 Chaldean Catholics celebrated Mass. In Moscow, the head of the Russian Orthodox Church, Patriarch Alexy II, prayed for the victims of a Siberian methane blast that killed at least 40 coal miners. And in London, Archbishop of Canterbury Rowan Williams -- spiritual leader of the worldwide Anglican Communion whose members also celebrated Easter on Sunday -- said the world must not forget those who die in often-ignored places like Africa. Easter was festive in Greece, where Orthodox Christians set fireworks and flares at churches across the country. This year, the holiday falls on the same day in the Roman Catholic and Orthodox calendars -- a coincidence John Paul mentioned when he expressed hope for more unity between the churches that have been split for 1,000 years. "I pray to the risen Lord that all of us baptized may soon be able to together relive this fundamental feast of our faith each year on the same day," he said. The head of the Romanian Orthodox Church, Patriarch Teoctist, echoed his call, saying there couldn't be "a more divine gift than the one that we celebrate Easter at the same time." In Istanbul, the spiritual leader of the world's Orthodox Christians, Ecumenical Patriarch Bartholomew I, said in his Easter message that the holiday was an occasion for hope despite religious fanaticism and the killing of innocent people in conflicts and war.